The practice of adapting contemporary music of the late 19th and early 20th centuries was aimed at making well-known works playable at home. The piano and the harmonium, as instruments for domestic music-making, were of the utmost importance. But for Karg-Elert, the harmonium, especially the Kunstharmonium, (art harmonium) was a concert instrument and one perfect for use in adaptations. Wagner in particular occupied a prominent place for Karg-Elert and he adapted 30 pieces from Wagner�s operas for these instruments. Whereas the strengths of the piano, as a hammer or percussion instrument, are based on virtuosity, dexterity and possibilities of different accents, the harmonium is particularly convincing because of an expressivity through sound production by means of free reeds. A variety of timbres, as well as crescendo and decrescendo on sustained tones, are its principal domain. 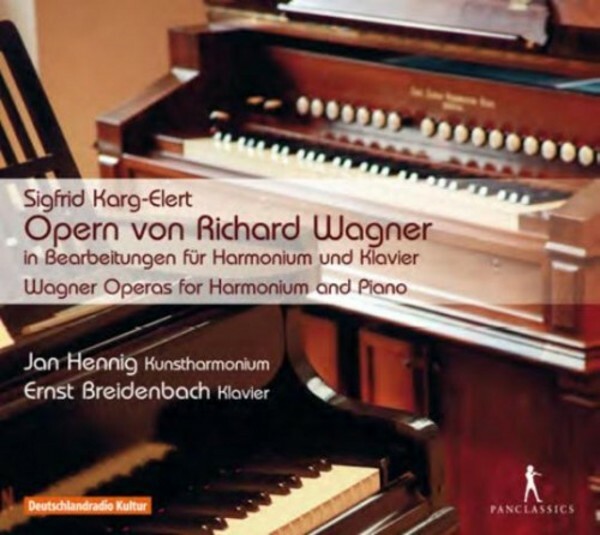 Karg-Elert�s Wagner transcriptions deserve a position of importance, for his artistic standards go beyond pure adaptation and the orchestral aspect is uniquely shown to advantage, especially in these harmonium-piano duo versions.